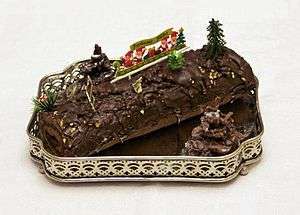 A traditional Yule log (bûche de Noël) made with chocolate filled with raspberry jam. A Yule log (or bûche de Noël French pronunciation: ​[byʃ də nɔɛl]) is a traditional dessert served near Christmas, especially in Belgium, France, Lebanon, Quebec and several former French colonies. Made of sponge cake to resemble a miniature actual Yule log, it is a form of sweet roulade. The original Yule log recipe emerged during the 19th century. It is traditionally made from a genoise, generally baked in a large, shallow Swiss roll pan, iced, rolled to form a cylinder, and iced again on the outside. The most common combination is basic yellow sponge cake and chocolate buttercream, though many variations which include chocolate cake, ganache, and icings flavored with espresso or liqueurs exist. Yule logs are often served with one end cut off and set atop the cake, or protruding from its side to resemble a chopped off branch. A bark-like texture is often produced by dragging a fork through the icing, and powdered sugar sprinkled to resemble snow. Other cake decorations may include actual tree branches, fresh berries, and mushrooms made of meringue or marzipan. The name bûche de Noël originally referred to the Yule log itself, and was transferred to the dessert only after the custom had fallen out of use, presumably during the first half of the 20th century. By 1945 it referred to the cake. ↑ "Noël". CNRTL. Retrieved 10 March 2015. 'la Bûche de Noël' in: Le Calendrier Traditionnel, Voici: la France de ce mois, vol. 2, no. 17-21, Voici Press (1941). Wikimedia Commons has media related to Bûche de Noël.